A greater demand exists within the defense and intelligence community for the ability to view and analyze a time series of images, especially as more UAVs and high-resolution satellites that capture motion imagery become available. Temporal analysis is used in applications such as change detection, tracking patterns and movement, and activity-based intelligence. Having the right software application to process data from the latest motion imagery formats can help to make more informed tactical decisions. ENVI is one of the first commercial software products to support the newest standard, MIE4NITF. The Motion Imagery Extension for NITF is essentially a container that defines a standard for creating a time series of NITF images. The MIE4NITF standard was developed to combine the rich metadata support in NITF images with time-series information provided by Wide Area Motion Imagery (WAMI) and Full Motion Video (FMV) systems. Modern hardware that collects this type of data will soon exceed the capacity of video standards defined by the Motion Imagery Standards Board (MISB). The MIE4NITF standard allows for greater bit depths, frame sizes, and numbers of bands; in addition to support for multiple cameras and data modalities such as thermal and visible imagery. ENVI 5.5 Service Pack 1 provides a new menu option: File > Open As > Military Formats > MIE4NITF. Selecting any file from a NITF image collection will open and animate the entire collection in the ENVI Series Manager. MIE4NITF raster series created from CorvusEye® WAMI data, 07 August 2014, Webster, NY, USA. An important aspect of working with MIE4NITF is the ability to analyze individual frames, or NITF images. The ENVI Series Manager allows an analyst to load specific images within a series to the ENVI Layer Manager for further analysis. Metadata are encoded as NITF Tagged Record Extensions (TREs). Right-clicking on a single image layer displays the NITF metadata for that image. 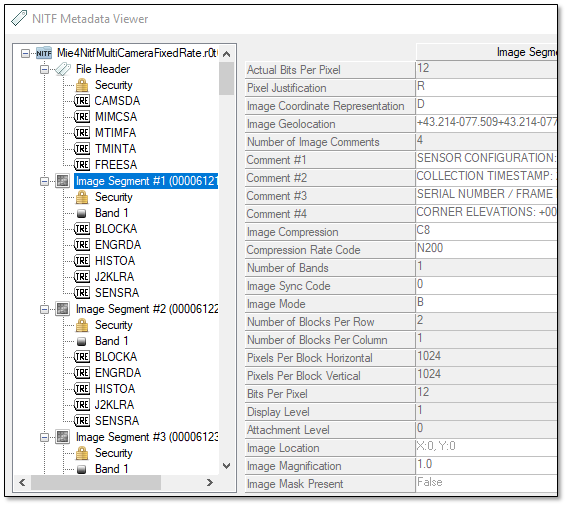 NITF Metadata Viewer in ENVI, showing metadata for a single image segment within a MIE4NITF series. By combining greater aerial coverage with detailed metadata, MIE4NITF is expected to become the new standard implemented across defense and intelligence agencies.